Looking for a reliable and honest MOT test centre in Oxford? Look no further! Call us on 01865 249661 or use our ‘request an MOT appointment’ now to book a date and time that suits you. We are registered to MOT cars and large vehicles such as vans, pickup trucks, tippers, 3.5 horseboxes and other vehicles up to 3.5 Tons Gross vehicle weight. 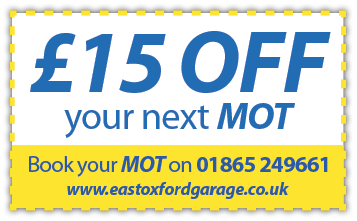 Why choose East Oxford Garage? Take advantage of these great Special Offers by printing them off and bringing them in with you. Located just behind the BMW Mini factory! Right behind the Oxford Mini factory.